It was a hot sunny day on The Strip at Las Vegas Motor Speedway, and the crew chiefs kept shifting plans constantly to counter the 125-degree track temperature, but also trying to combat the tricky conditions while being able to muster just the right amount of horsepower and traction on the treacherous slick surface. We all know that Las Vegas is a town where your fate can change in less than four seconds. 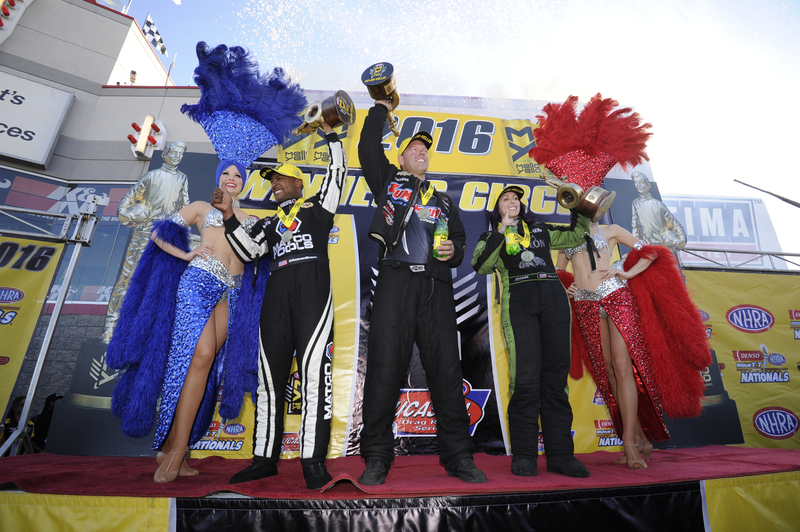 That was just what defending Top Fuel Champion Antron Brown needed to do in turning his glum start to his 2016 Top Fuel season into splendid grandeur on the Strip at the Las Vegas Motor Speedway turning back first time finalist, Troy Buff. The Denso Spark Plugs NHRA Nationals halted Alexis DeJoria’s winless streak at 33 races, creating one of the largest mosh pit celebrations on the starting line, having her Kalitta Racing teammate, Del Worsham alongside competing in the other lane. In the back yard of KB Racing, Jason Line didn’t disappoint his boss, Ken Black, winning the race against fellow KB teammate, Bo Butner, who red-lighted on Sunday. In the K&N Shootout on Saturday, Greg Anderson scored the $50,000 grand prize for KB Racing. 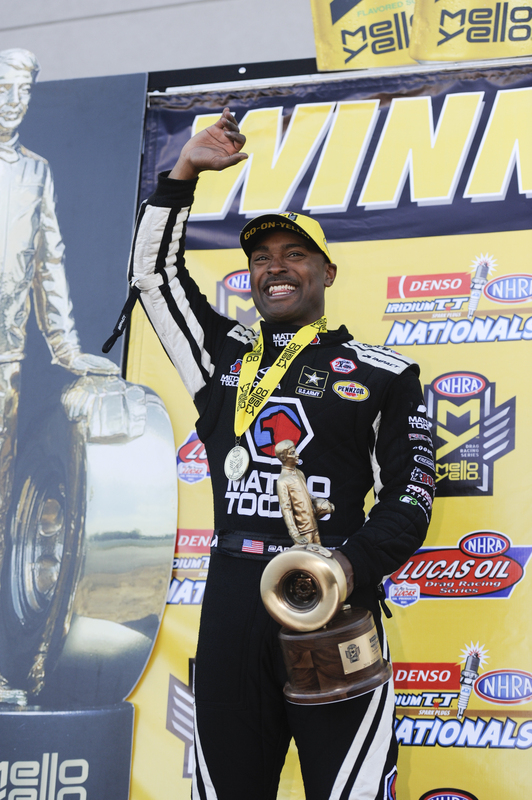 It was just two weeks ago that defending Top Fuel champion, Antron Brown was asking questions of what was happening to his season, finally finding out all it took was a little patience. 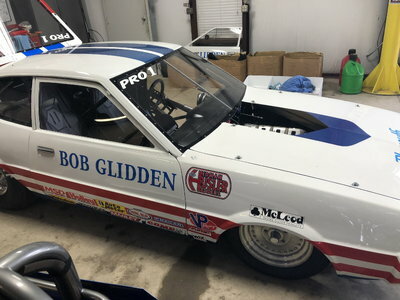 It’s just the nature of drag racing, in that, you’re good one day and in Brown’s case, winning something he hadn’t seen since last October on his way to his second title. It just wasn’t Brown that was having problems, but after the first three races, none of the DSR Top Fuel cars had advanced past the second round. So, after getting his 55th overall NHRA win counting the 16 as a Pro Stock Motorcycle racer, he was relieved to finally find the winner’s circle again. “It’s huge, especially considering where we came from,” Brown said of their early season struggles. “We had a rough start to this year and it’s just the way it goes sometimes. We had a couple of things we had to change – you had to change your combination around because you have different parts and pieces than you had before. We started and it wasn’t as if our car wasn’t running well. 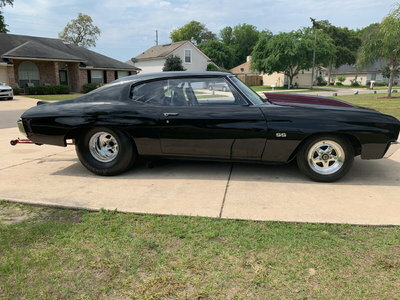 It was running great. You come out, you just want to win, you want to win early, and you end up pushing too hard. Brown mounted round wins against Scott Palmer, Leah Pritchett and Dave Connolly before meeting first time Top Fuel finalist, Troy Buff, driving for Bill Miller Engineering, for the money round. Brown ripped a conservative time of 3.843 seconds, 314.68 mph to beat Buff with his gallant effort of 3.918 seconds, 307.58 mph. “That’s pretty special,” Brown said with his patented smile. 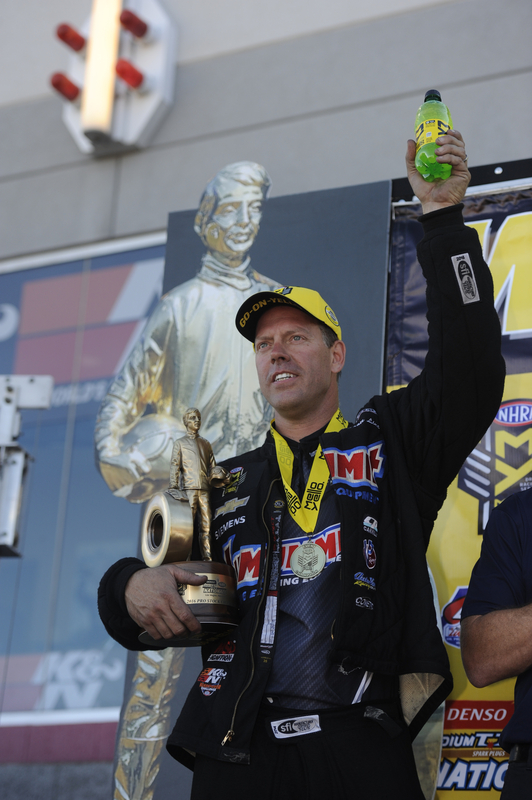 “Anytime you win an NHRA Wally it’s special. You don’t look at what you’ve done in the past. That’s one good thing about our team. We look to the future. As long as we can compete and as long as we can be competitive, I’m going to be out here as long as I can. Every time we line up on that starting line, you give it all you have. 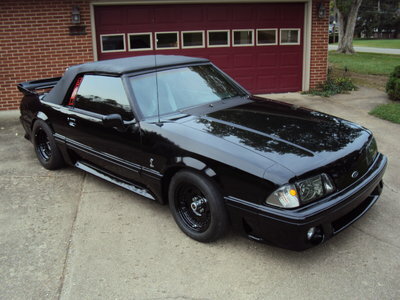 Growing up as a kid in New Jersey, this has always been my passion. It’s always been what I love and to do what I love is just a blessing to be out here. 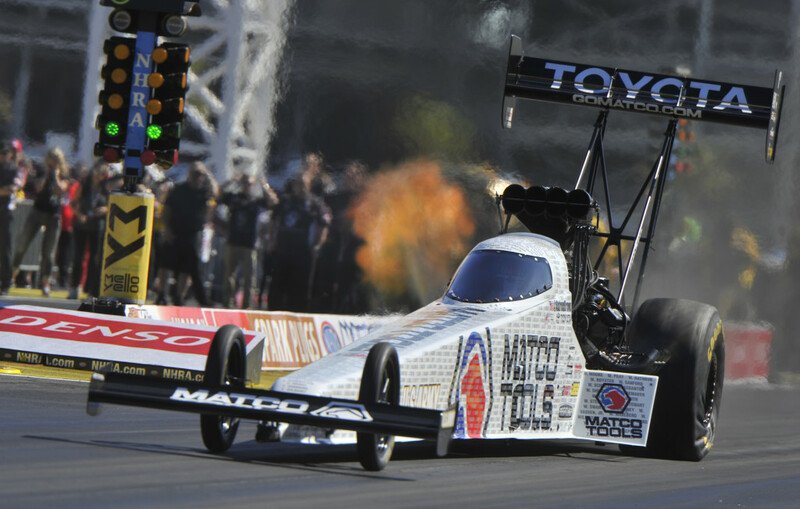 Since 2009, the Matco Tools team has 13 more event titles than the next most Top Fuel driver does. The Matco team has 37 event titles to DSR teammate Tony Schumacher’s 24 titles in the same period. Brittany Force still maintains her lead in the Top Fuel points standings with a 38-point advantage over Antron. With his win, Brown leaps from 10th to second in the points and in third, now only 40 points away from the lead, is Doug Kalitta. In other Top Fuel news, NHRA’s oil down rule really hit Leah Pritchett hard with a 45-point deduction after numerous oil downs over the weekend from her Bob Vandergriff-owned team. Alexis DeJoria charged to the front of the Funny Car pack in Las Vegas, using great runs and better reaction times to drive her way right to victory lane. She reeled off round wins against Tommy Johnson, Jr., a .002-thousandth of second holeshot win over John Force Racing’s Robert Hight in the quarterfinals then taking down the man himself, the 16-time champ, John Force in the semifinals. You could call it “Lady Luck” that was riding on her side once again in the finals in Las Vegas against her Kalitta Racing teammate and reigning Funny Car champion, Del Worsham. Both cars were set at their performance best of the day, getting a major ovation out of the packed crowd and laying down side-by-side 3-second Funny Car runs. They saw DeJoria leave first off the line, going quicker on The Strip at Las Vegas Motor Speedway as she picked up her career fourth Funny Car win in seven final round appearances. It was her first of the 2016 NHRA Mello Yello Drag Racing Series season, posting a time of 3.968 seconds, 315.49 mph to Worsham’s time of 3.988 seconds, 323.58 mph. 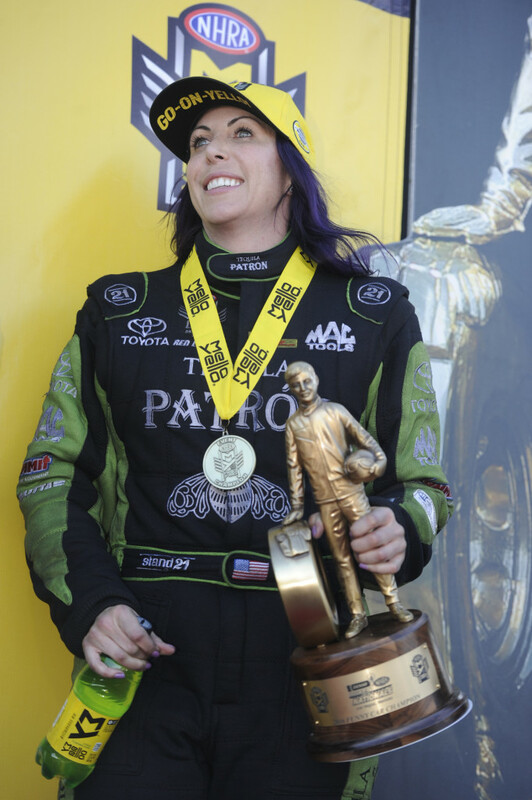 With three runner-up finishes, and now hoisting four Wallys, DeJoria became the third woman in a row to pick up a win in the 2016 NHRA Mello Yello series. “To be a part of that, it’s incredible. Three women in the last three races including myself have won. It’s an amazing time in NHRA Drag Racing. 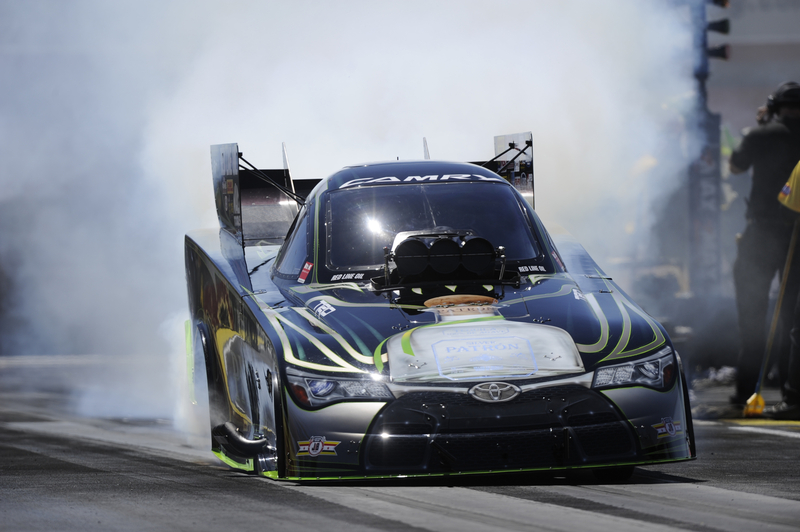 We’ve come so far,” said DeJoria, whose last win came at the 2014 U.S. Nationals. The semifinal round win meant DeJoria would face her Kalitta Motorsports teammate and longtime mentor, Del Worsham, in the first ever all-Kalitta Funny Car final. “It’s been a dream of mine to race Del in the finals, and going up against him, is no easy feat. I was pretty excited to race him in the final but man, I wanted to win so badly,” said DeJoria, who now occupies the eighth position in the Mello Yello Funny Car points standings. Before Vegas, DeJoria’s Tequila Patron Toyota team was having a poor start to her 2016 season. 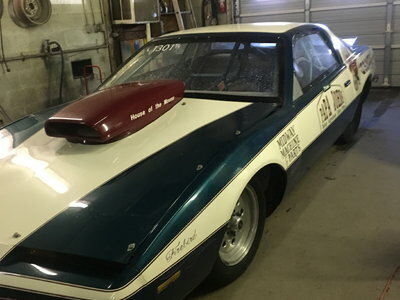 In only her last two races showed two first round losses and had qualified in the back half of the field for both events. Robert Hight assumes the points lead, having 47-point margin over John Force followed by Ron Capps, who rocked the Funny Car category by not qualifying for the race, his first DNQ since the 2013 Seattle race. Besieged by a myriad of mechanical woes, the DSR NAPA team was the points leader going into Vegas and has now slipped to third. It was a reprisal for Jason Line to win the Denso Spark Plugs NHRA Nationals Pro Stock portion of the race after having to forfeit his chances from the day before in the K&N Filters Horsepower Challenge finals against teammate, Greg Anderson discovering dripping oil from underneath his Camaro. 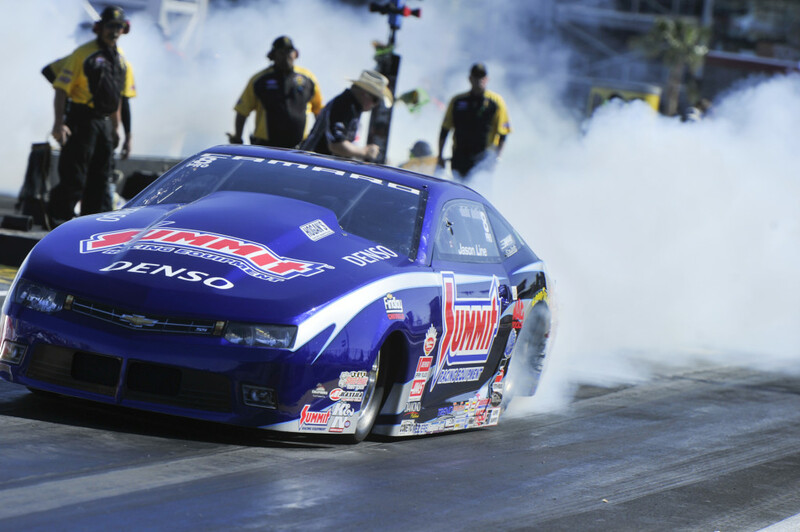 On Sunday, the day belonged to Line, taking on and beating Matt Harford, Chris McGaha, and against his long-time nemesis, Erica Enders in the semi-finals. 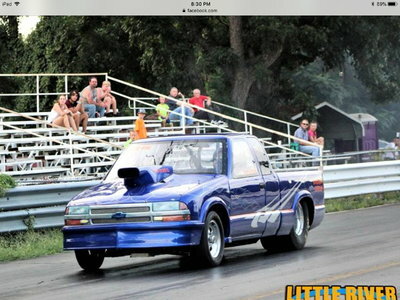 In the finals, it was Line against his other KB Racing teammate, Bo Butner. The hype of the final round was over once Butner left too soon, displaying a bright red light in his lane giving Line his 39th career victory in the class. Line was also the No. 1 qualifier. “We’ve never had a start this good, even back in the heyday,” said Line, who has advanced to the final at each event so far in 2016. “It feels really, really good. It is tough and is difficult, but everybody on our team works hard. Of course, we love Chevrolet and all the fans for coming out. I want to say congrats to Bo for making the finals. Line extends his points lead over Anderson to now 48-points followed by Bo Butner in third. The next NHRA National event will be at the zMAX Dragway in Concord, NC, for the running of the NHRA 4-Wide Nationals on April 22-24.